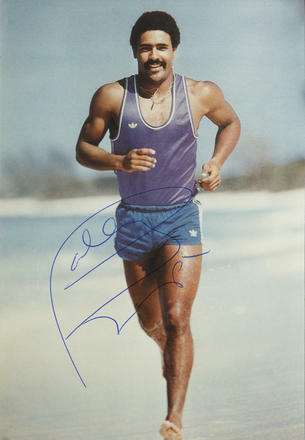 This is a Hand Signed Colour photograph 7" x 4.5" by the British former Decathlete who won two Olympic Gold Medals in 1980 and 1984. Francis Morgan Ayodele "Daley" Thompson CBE (born 30 July 1958), is a former decathlete from England. He won the decathlon gold medal at the Olympic Games in 1980 and 1984, and broke the world record for the event four times. With four world records, two Olympic gold medals, three Commonwealth titles, and wins in the World and European Championships, Thompson is considered by many to be the greatest decathlete of all time.